Originally published in 1995, this book explores a number of subjects of significance for labor and economic policy, especially the role of U. S. tax policy in the relocation of jobs from the contintental USA to Puerto Rico. The book demonstrates the problems for the USA because of inadequate adjustment policies to protect the interests of communities and workers when plants close and production is relocated. It disproves the myth that markets will take fcare of workers and communities, showing that basic economics is concerned with market forces and not with equity, environmental and worker protections. 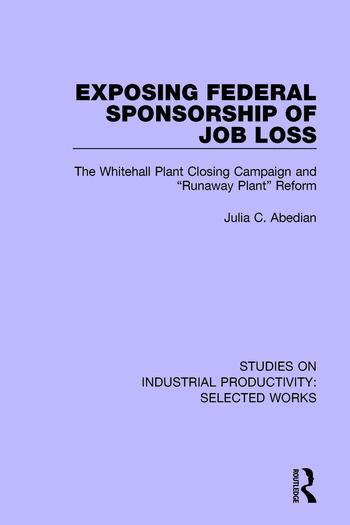 The Whitehall plant closing case is documented and the economic and political context analyzed which caused that case to be instructive for broader economic and labor policy purposes. In a new age of American Protectionism, this book has enduring relevance. 1. The Antagonists, the Issue, and the Political and Economic Antecendents 2. Obsolescence of the Picket Line: Taking the Battle to the Courts and Capitol Hill 3. Primetime, 60 Minutes and Michael Moore: The Media Campaign 4. Was It Worth the Fight?